A workshop for choreographers to learn where gender messages get encoded in their movement and staging choices. An embodiment workshop for gender studies students. 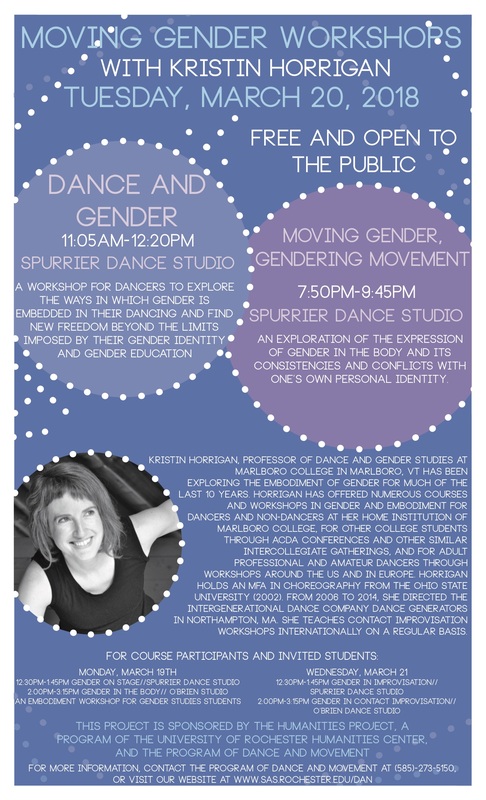 A workshop for dancers to explore the ways in which gender is embedded in theri dancing and find new freedom beyond limits imposed by their gender identity and gender education. Exploration of the expression of gender in the body and its consistency and conflicts with one's own person. A workshop for dancers to explore the ways in which gender is embedded in their dancing and find new freedom beyond the limits imposed by their gender identitiy and gender education. An exploration of how gender habits and gender expressions shape our movement in the inherently ungendered partnering from contact improvisation.